It is really neat to see them all together. I even kept the not so good ones in. The site she told us is called PicMonkey and it is free! Check it out. Pretty impressive. They are all good Renee, some better than others, but all good and certainly all benefit from being shown in a collective! I have some favorites though, one titled zipper waves, I think and study 29 rates high. Your favorites? Thank you Theresa. Sometimes, not always, I wince at posting some of the not so good pieces. The ego and the desire to do better comes to the surface. However, I really do want to show the process. Every artist, even the great ones, has off days. It is how we grow. I post them to hopefully encourage others who might be struggling with the same things or just struggling to start. I like Zipper wave too but I think my favorites are Hug Point, Winter Morn, and By a Jade Green Sea. For me, there is emotion wrapped up in them too. I love Hug Point, its beauty has a special place in my heart. I was happy with the quality of light I captured in Winter Morn and Jade Green. All of the paintings have a story and significance for me. I will be getting the rest up on my website and DailyPaintworks to sell. I am looking forward to continued growth and painting more. Thanks again for the comment. Now maybe I will have a chance to catch up on your, and everyone elses blog! 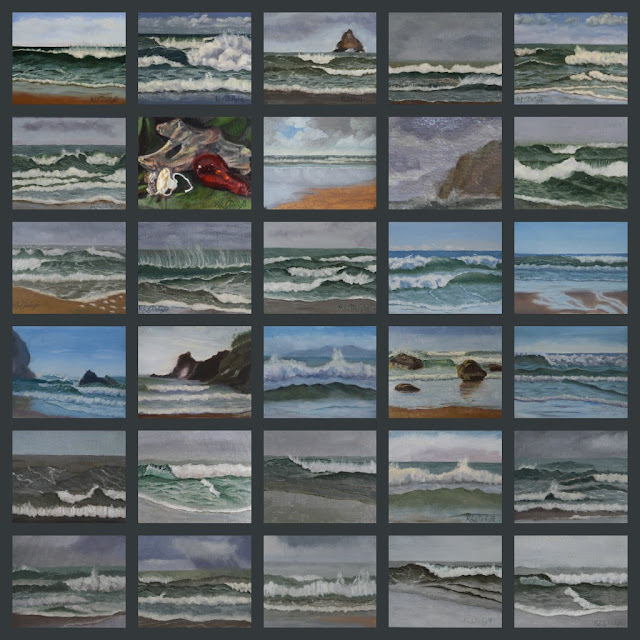 I just love seeing your wave paintings gathered like this. It is such an inspiration. Congratulations Renee! Thanks Dana! I can see that a collage of your textile work and table settings would work quite nicely in this format too!